When I fished as I child I was generally handed a cane pole pre-baited and set up and sometimes already cast. The crappie, usually, would bite and I would pull it in and someone would take it off the hook and put it on the stringer and put another cricket on the line for me until I was big enough to learn the whole process myself. Of course, as a Southern teenage girl more interested in listening to Muddy Waters than spending all my time around actual muddy waters, I lost touch with fishing. To be honest, there wasn’t a lot of appeal to the culture I perceived to surround fishing down South. I associated it with a lot of things I spent the following years trying to separate from entirely which is too bad, because I kind f threw the baby out with the (muddy!) bath water for a while there. When I moved to Alaska, fishing took on this new mystique for me. Suddenly it involved people who were interested in culture and conservation AND beer and camp fires! This was the REI version of fishing I never knew existed, and it turns out fishing cleans up really well. I wanted in, but I didn’t even know where to start. This was uncharted territory and my cane pole and crappie experience was laughably useless. Consequently, fishing became one of those things I waited a long time to take up on my own because people always said they would take me, teach me, and they never did. I didn’t grow a set and buy my own stuff and start figuring it out on my own until, oh, maybe two years ago. Today, I own a small collection of gear stuck in storage up North, mostly selected for various Alaskan salmon runs, costing perhaps $800 or so in total. This is an extremely modest collection as I mentally survey my friends and their respective kits. Fishing, like pretty much everything, can quickly become a total gear head hobby, and as a fisherman here in Mexico currently without the gear she’s become accustomed to, I have been frustrated. Hand line spindle with old line and a rebar weight for practice casts. 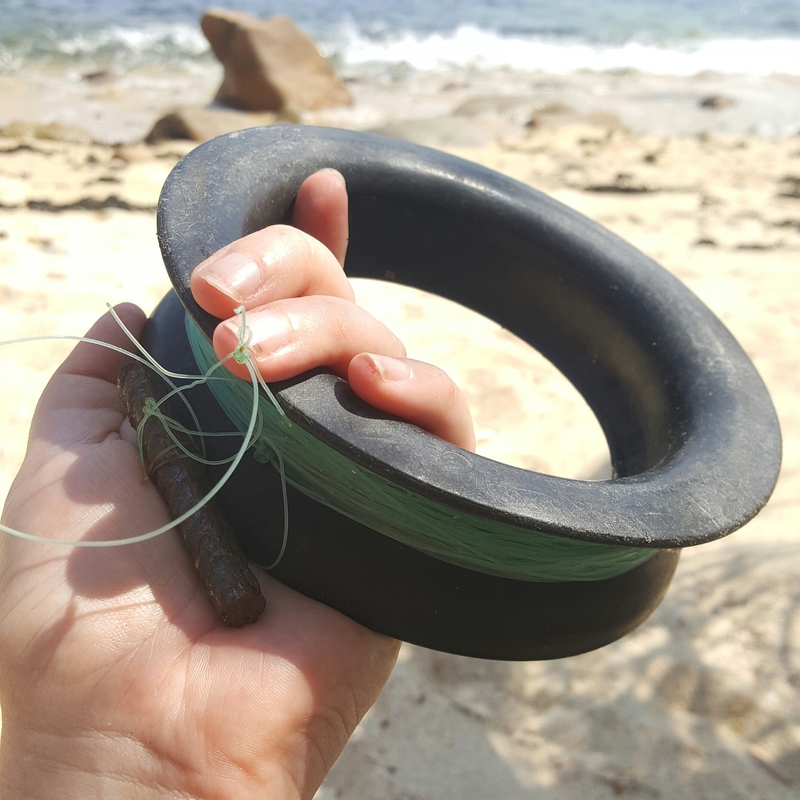 I noticed a lot of people here along the Banderas coastline carrying around fresh catches and standing on the rocks or on the beach casting…but there was never a rod or reel of any configuration in sight. Finally up at Boca de Tomates I got close enough to watch a handline in action. It was a weird eureka moment—people have been successfully catching fish for millennia with extremely rudimentary tools and it’s a craft that is alive and well here on the Pacific coast of Mexico. The locals here seem to prefer a small black spindle, about 8″ in diameter with a groove down the outside center formed by an up-turned lip on either side—one straight up and one angled out—to hold the line. The rigs I have inspected so far really only have three things in common—a length of heavy line, a weight, and one or more hooks. The tackle has been arranged in all the same arrays of configuration that you might see in other salt water fishing rigs, as have all other techniques. To cast, a length is pulled from the spool and swung lasso-style above the head before releasing towards the water. (Apparently. With practice. At least Paul can show you how it’s done in the video below.) I had a lot of trouble coordinating this motion while holding the wheel just so to allow the line to spool off over the edge without gripping the whole thing in a death grip and stopping the line short. It is certainly something that takes a lot of practice and skill to achieve accuracy and distance and I particularly enjoy the extreme hands-on approach. My beginner casting was so poor that I spent most of my time on the beach spinning just the weight above my head in practice casts so I never got to experience a fish on, but the thought of bringing one in on such a simple rig is quite a thrilling prospect and now that I finally have my own handline all set up, you’ll probably be able to find me on the rocks most mornings. Aside from the extremely intimate and organic feel this kind of fishing produces, there is another benefit—literally all you need to replicate it where ever you may find yourself is a length of heavy line and a hook. 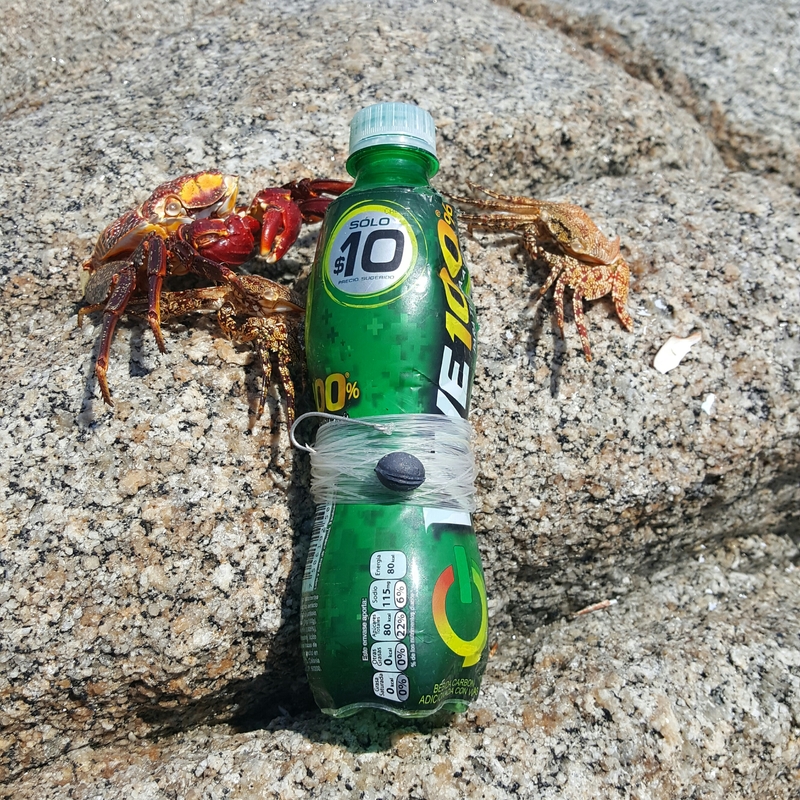 These rigs are often recreated using household objects and actual garbage (glass and plastic bottles, especially those that narrow a bit and have a good neck, are perfect,) and I have seen weights consisting of rocks, short bits of rebar, spark plugs, and yes, even traditional fishing weights all used. You can get fancy with your tackle if you want, but I’ve seen a lot of fish pulled in without it. My current salvaged set up. The funny thing is that suddenly…I’m not feeling that much urgency to get my gear down here. This has stirred up all kinds of funny Swiss Family Robinson, can-do make-do sorts of feelings. Somehow I feel inspired to master this most simple version of fishing—partially out of necessity and partially because the challenge is irresistible. Looking back, I find it funny that I eschewed those early days with bamboo poles and crickets in favor of expensive rigs, frequent frustration, and gear woes. It is liberating to lose the excess in these things, too, it turns out. I really like some of the creative handline ideas Keith Williams has on Briar Patch Outdoors. A decent overview by Alex Burton on Wide Open Spaces. On The Water—Cod Hand-line While I’m personally not going for the big guys (yet! ), handlines have been historically used to pull in some monster groupers and tuna. This is a great example of a cod set up from a Smithsonian collection. I really like some of the commercial handline rigs on this site if DIY just isn’t your style. I also like the “how to” video on this bottle-style setup. It shows some of the more simple casts you could do from a boat when you don’t really need the distance to get out past the rocks. This video shows a guy bringing in a black tip shark from the beach on a yoyo spindle. Apparently the spindles I see everywhere here are popularly known as Cuban yoyos. Here’s a video about rigging one for some big fish and same guy on casting. Another totally different style of both handline and casting. Honestly I could sit here and post YouTube videos all day without getting bored, but I’ll let you go down that rabbit hole yourself. You’ll see exactly how far this really basic skill and idea can take you. Ok, wait, you gotta check this one with a marlin.